Providing value by creating downloadable content can start you down the path to productizing your freelance expertise. 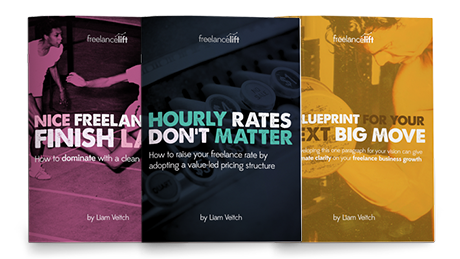 I’m often asked how I find the time to create relatively in-depth short books, which I generally give away for free on Freelancelift. I consider myself to be relatively adept at sitting down and being able to produce something of value quickly, however I used to struggle with ‘blank page syndrome’. So I wanted to give you the quick scoop on my process; how I create my ebooks for Freelancelift and Ownerd now I’ve got the whole process down to about 7 hours and the structure guide (to download) and process I follow. Before I let you in on the process I just wanted to touch upon the motivation for putting out valuable content in the first place. I’ve spoken at length about the problem with ‘freelancing as usual’ and the moves you can make to counteract the constraints. Creating a side project which delivers a modest level of byline income ($1,500+ monthly) is one of the best ways to break the day-to-day instability of freelancing. Within Handiwork I teach freelancers how to get off the income roller coaster by developing products from their freelance expertise. Indeed, I surveyed 533 freelancers of which 94% stated they planned to try to develop a product in the next 6 months, and most had at least tried to create an ebook to start that process (will share the specifics of that survey in another posts as the results were fascinating). So creating an ebook is the easiest first step towards creating provide a profitable side project (even if you give it away for free initially to build your audience) and its why I wanted to share my process so you can start down this path for yourself. Firing open an empty doc is procrastination heaven. The job before you is so overfacing you literally invent distractions to pull you away from actually getting on with the job in hand. As a freelance designer I was struggling to justify the time I spent staring at a blank Word doc so I needed to do something about it. I created a system for building products which I’ve refined over the last two years (which is now pretty much everything inside Handiwork) but one of the most helpful bits I can share with you was the templated structure guides I created for a book, ebook and video training. Focusing on ebook in particular, I’ve managed to get the whole process down to about 7 hours from start to finish. This time is broken out into two or three sessions and I get a neatly designed, legible 4,000-6,000 word PDF at the end of the process. Those hopefully show you that I’m not skimping on the meat, or sacrificing quality on the alter of time its just that I have a system that provides me a process and focus so I wanted to share it with you. It starts with the template, here is my boilerplate you can download for creating your own ebook. You’ll find the structure guide itself relatively self-explanatory and you should use it as a prompter to guide you through how to start the ebook, how many chapters it should contain and how you close it out. 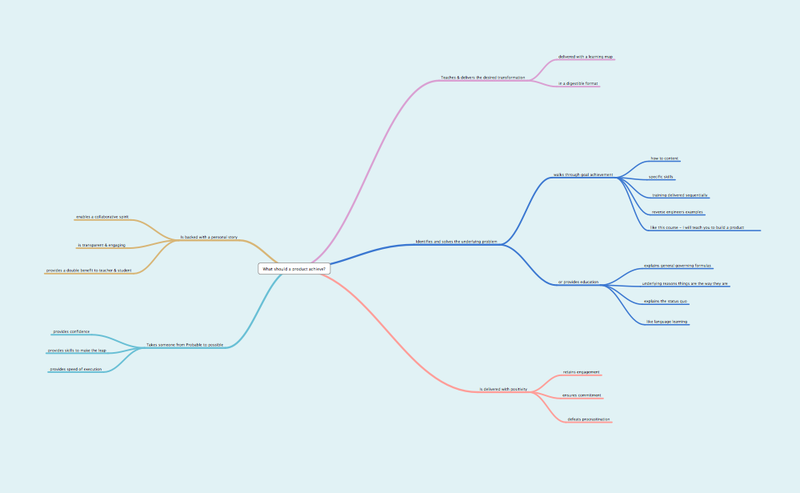 Mindmap in hand I hit record on my iPhone in Skyrecorder (although Voicenotes is fine) and just start speaking aloud, reading through each node thinking of examples and clear explanations as I go. It’s a strange thing – if you met someone in real life in your space who asked ‘Hey what’s your rough process for XYZ’ you’d not stand there silent (real-world writers block), you’d at least come up with an answer to avoid that social awkwardness. So in this stage I’m just going through my normal parlance and letting the words flow as if I were explaining it in person. I normally ramble on for 20-30 minutes and then just wrap up that first session – sending the recording to Lainie my transcriber. A couple of days later I receive 4,000-5,000 words back, neatly formatted and structured with headlines but still needing some editing to read well as a book. Now that I have the bulk of copy its really easy to cut away, improve and edit in such a way that is much more productive than starting from blank. Even if I often end up rewriting the whole thing I at least have content I can utilize to make my job 10x easier. I am a designer by trade, so I custom created my ebook design and I find it a simple job to drop in the content but if those abilities are not within your wheelhouse you could emulate with a $6 template like this and reliable freelancer on hand (expect to pay $50-60 for ebook layout for 4,000-6,000 words). It all starts with the structure guide though and a reliable, repeatable flow for creating a product which will turn into real income to help steady the freelance ship. This is what I teach at Handiwork; a video training platform backed with a complete book. We launch on 1st April 2014 and you can start from $49 if you’d like to learn how to create products of your own. Would this be the same framework you would use for a paid ebook too?